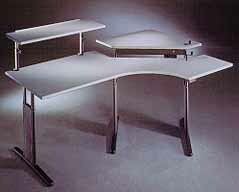 The Combi Corner Workstation combines the best features of a bilevel and single surface table in one design. The bilevel surfaces fit into a corner environment with independent height control of the keyboard and VDT surfaces from sit to stand just like the bilevel Generation IV products. Expanding from one side of the corner position is a 48" x 72" extension to encompass various data entry devices from a mouse to trackballs to digitizers as well as reference and source documents. Note: Model 5121 shown above with optional Desktop overshelf model 5560.